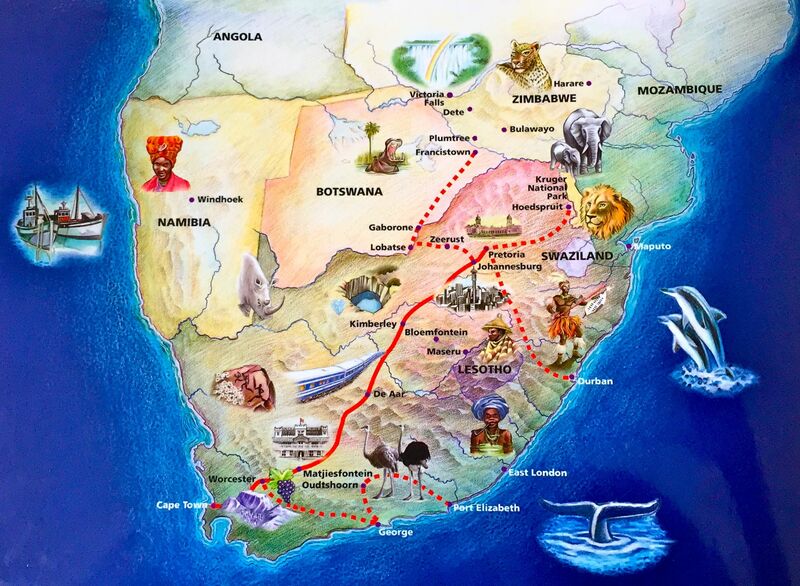 Today I’m embarking on one of the Great Train Journeys – a trip on The Blue Train through the heart of South Africa. I love train travel and this is no ordinary train so my expectations and excitement were high. I travelled northbound, starting in the Mother City of Cape Town and heading up through the Winelands and the vast Karoo to Pretoria. More of the scenery in pictures on my next blog post – here’s the route marked in solid red that I took. The journey takes 27 hours – 27 hours of the ultimate in relaxation that I really did not want to end. 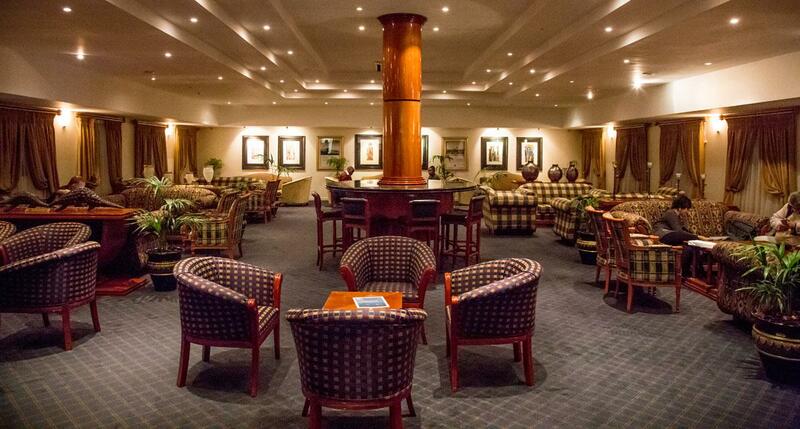 You know you’re in for a wonderful experience as soon as you arrive at the departure lounge. It seems like in an instant you’ve been checked in, your luggage has been whisked away and you’re sitting comfortably with a welcome pot of tea in front of you and your journey to ponder. Soon it’s time to embark (not a moment too soon for me, I practically ran onboard)! Your butler shows you to your suite and explains how everything works. The suites offer a feel of days gone by with their sleek walnut panelling and also all the modern comforts. Gotta love the modern comforts. 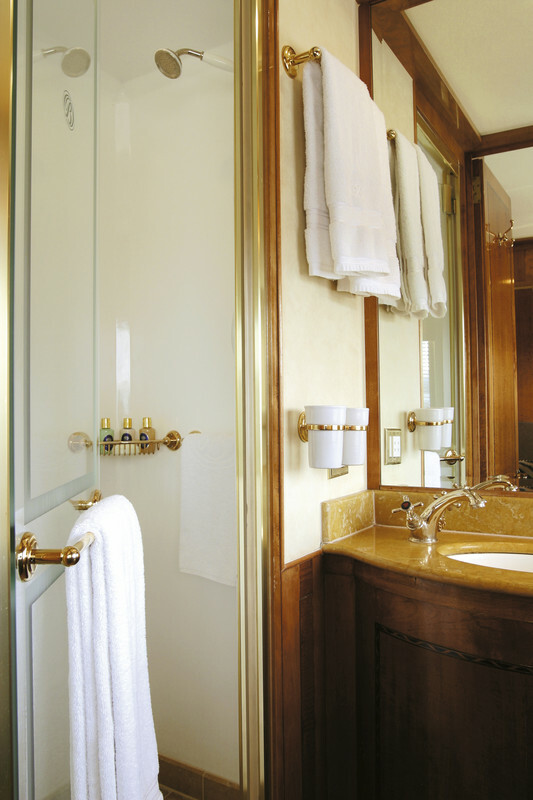 Like the ensuite bathroom (not even the Orient Express has these) – cleverly designed to fit the shower, basin and toilet into the smallest of spaces, complete with Italian marble, loads of fluffy towels and remote control blinds. When you head off for dinner (more about the fabulous food coming later in another post), your butler magically transforms your comfortable seating area into a bedroom, the bed made up with luxury duvets and linen, making it so easy to snuggle down. While your entertainment is endless – all you need to do is look out the window – the suites also offer radio and movie channels. The perfect indulgence – anyone for the whole series of Grey’s Anatomy? Tempting as that might be, there’s no time for that yet – there’s the rest of the train to explore. 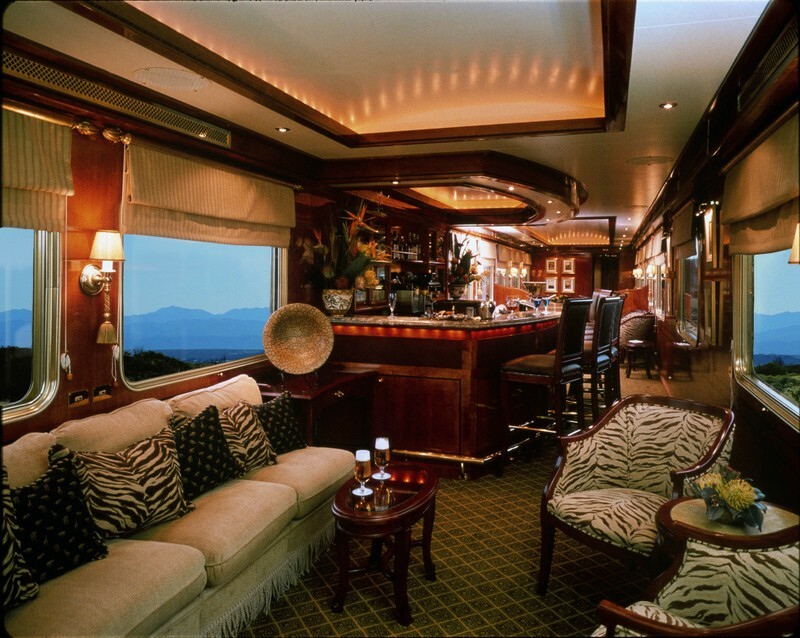 At the front of the train, the Club Car is the perfect place to relax after dinner and the only place where you can smoke. Cuban cigars are included in your price – I almost turned into a cigar smoker for the day…just because. 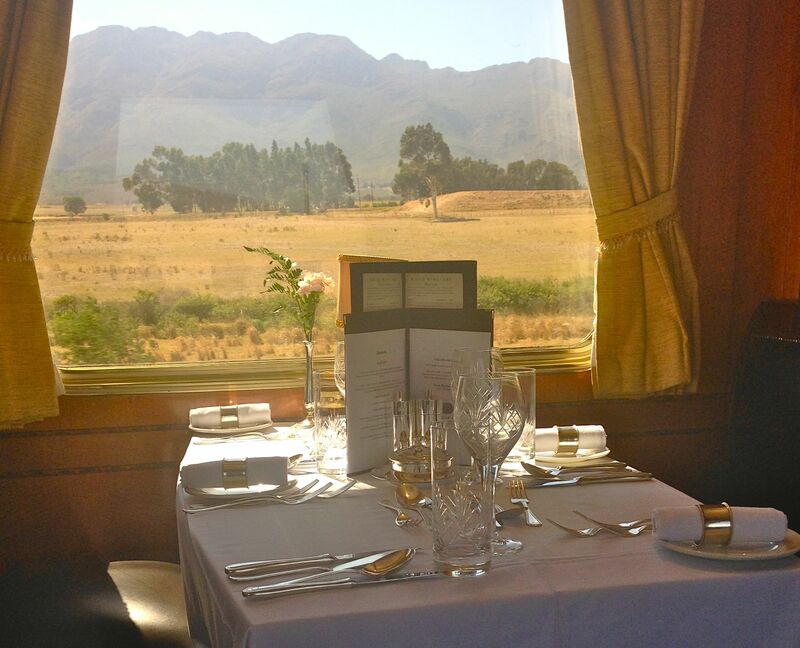 The dining car sits in the centre of the train and is the scene of absolute delight for the three meals on the journey (more of them later). This was my table where I happily devoured delicious dishes, drank in the view and several different wines from their extensive list. 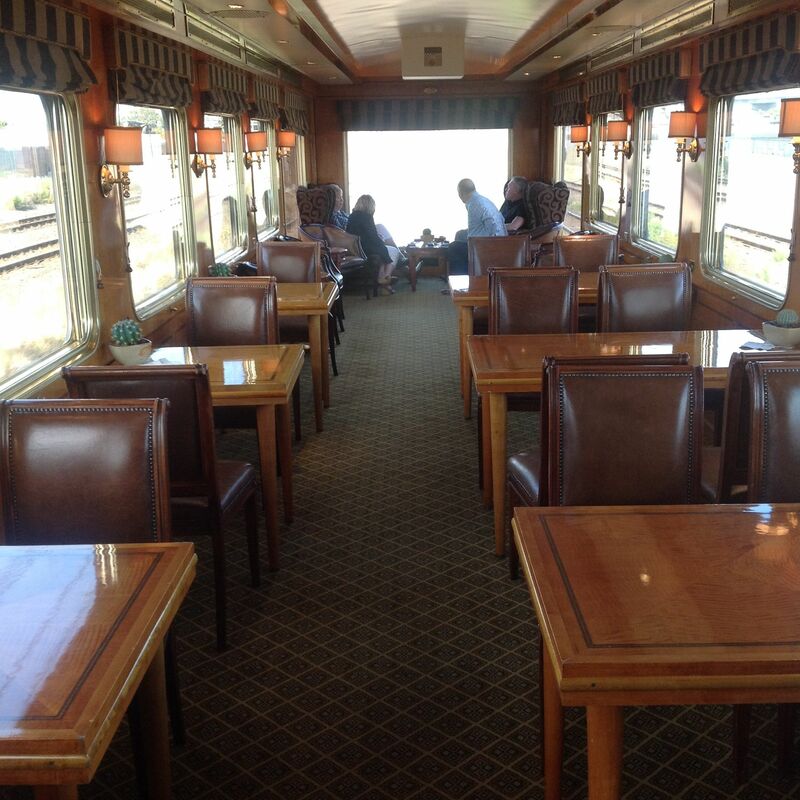 The Lounge Car is the perfect place to settle down on a comfy sofa and ponder life. 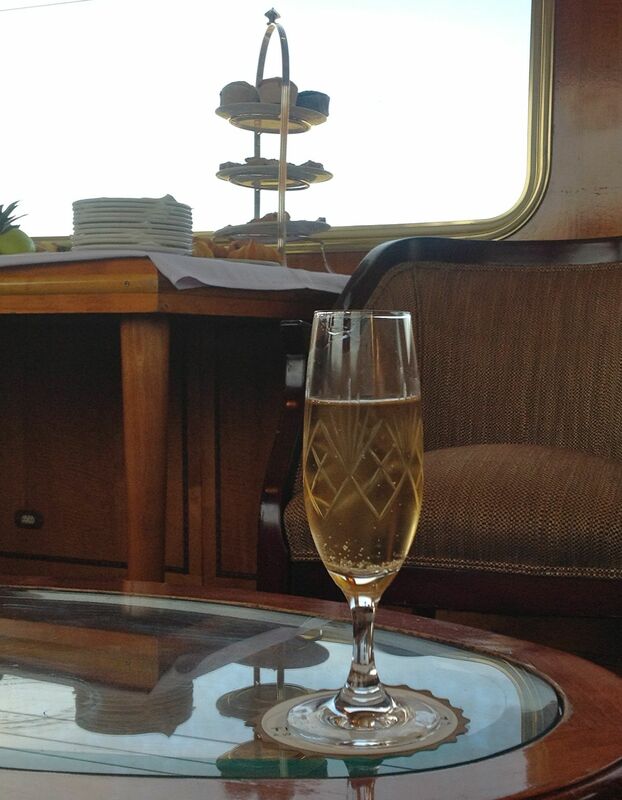 It’s also where High Tea is served…don’t cucumber sandwiches and Champagne go perfectly together? What a train…what an experience! To summarise, here’s what I loved about it. It’s friendly, efficient and all-encompassing without being claustrophobic or overpowering. Your every need is met in a gentle, welcoming way. I felt immediately at home and found every member of staff helpful, friendly and knowledgeable. Okay this is a bit of an intangible one, but it’s there. From the moment I stepped onboard it all felt like a bit of a dream, I even texted one of my friends saying “I feel like I’m in a movie”! Plus a vaguely Hercule-Poirot-looking fellow traveller made me keep my eyes out for any signs of murderous behaviour (of which there was none of course). Stunning, stunning, stunning and constantly changing. The contrast is huge, too, from the moment you wave goodbye to majestic Table Mountain towering over the Mother City, through vineyards, orchards, farmlands and mountains in the Winelands, the magnificent pass through the Tulbagh Valley and on through the desolation and vastness of the Karoo, there’s something wonderful to behold. Even the [slightly] more urban landscape as you approach Johannesburg has its charm. A humbling experience that puts the vastness of this beautiful country into a clearer perspective. More pictures coming in a later blog post. This was so amazing I have to blog about it separately (of course)! 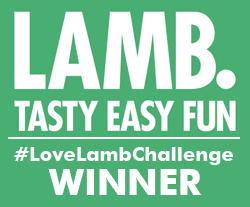 Safe to say it was magnificent, watch this space to find out more. The train can take around 80 guests (plus staff) but it never seems like there’s anywhere near that many onboard. It’s an intimate experience that seems like your own personal journey. 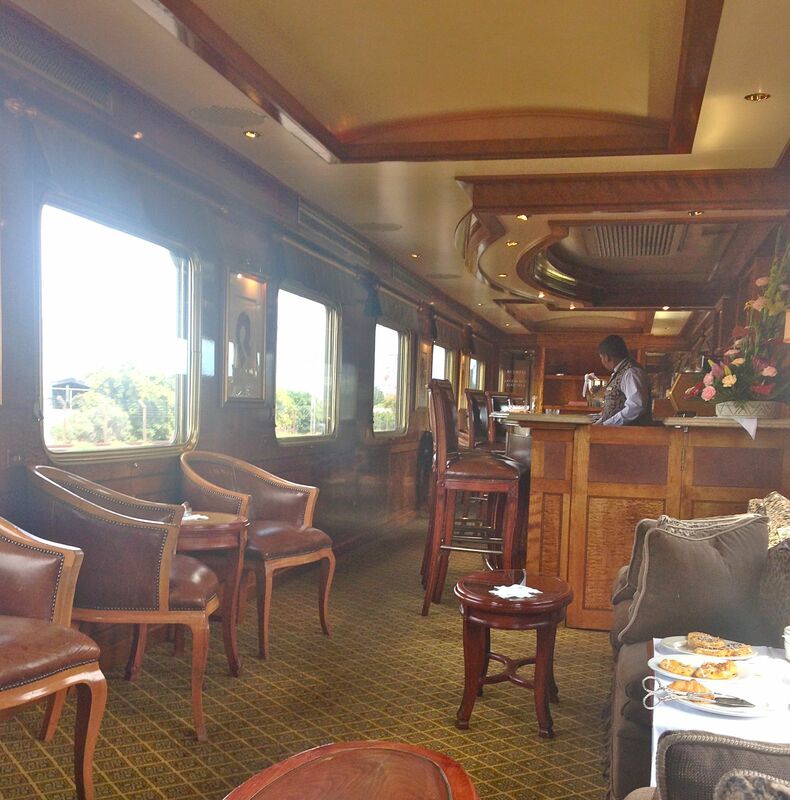 Comfort is at a premium, decor is stylish and subtly African and the different carriages provide several separate places for relaxation. Plus the huge picture windows throughout mean the light’s constantly changing with the scenery. Sunset was quite spectacular and it was lovely when I opened my blinds early in the morning. Nothing like harnessing natural light and landscape to enhance the atmosphere. So much! Vibrantly colourful fruit platters and flower arrangements everywhere, the box of chocolates on your pillow when you go to bed (yes, a box), top quality duvets and linen, fluffy towels, your butler who’s constantly transforming your suite into a different version of itself, the amazingly relaxing check-in service. Clearly all this is not going to come cheaply. But the good news is that if you include The Blue Train as part of a package to South Africa from the UK it becomes incredibly good value. For example, African Pride are offering an 8-night Classic South Africa package from just £2,999 per person which includes all flights, taxes, transfers, 1 night in Pretoria, 1 night on the Blue Train, 4 nights at the Victoria & Alfred Hotel on Cape Town’s Waterfront and 2 nights on safari at Motswari Private Game Reserve. Plus a lot of the meals are included. You can find out more by clicking here. 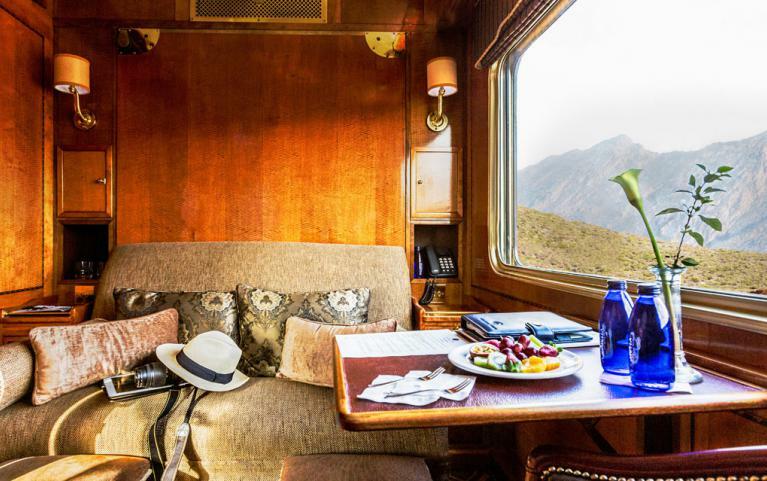 The Blue Train is one of those uniquely magical experiences, the memory will stay with me forever, now all I have to do is ride the train all over again..but this time the other way around. Watch this space for more about the amazing scenery you’ll encounter and the totally delectable food you’ll consume. The Blue Train rocks!